Get the front end of your 4x4 securely protected even during the most demanding off-road adventures with sturdy, reinforced Full-Width Raw Front HD Bumpers by Poison Spyder! Apart from providing the entire front end coverage, some of the applications can be customized to allow the installation of additional sturdy components for even better protection. They are ideal for off-road adventures, as all full-width Poison Spyder front bumpers offer added strength, best possible ground clearance, and wide approach angles. They are custom tailored to the specifications of your model and will provide your 4x4 with the brute strength whenever you need it. 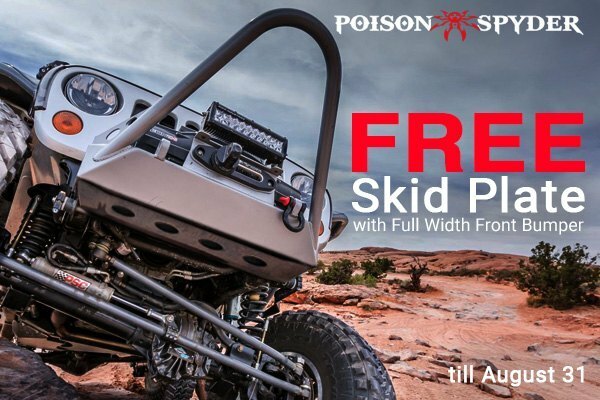 Till the end of summer 2018, get FREE Skid Plate with purchasing Poison Spyder Full Width Front Bumper. Choose one of Poison Spyder Bumpers and get FREE Gifts! Hurry up and use Summer Promotion from Poison Spyder at CARiD!